Stream restoration Segment 4 from overhead - we grew grass in December! Happy New Year from the KVT project team! We are off to a strong start in 2016, and we plan to make significant progress through the winter and early spring. 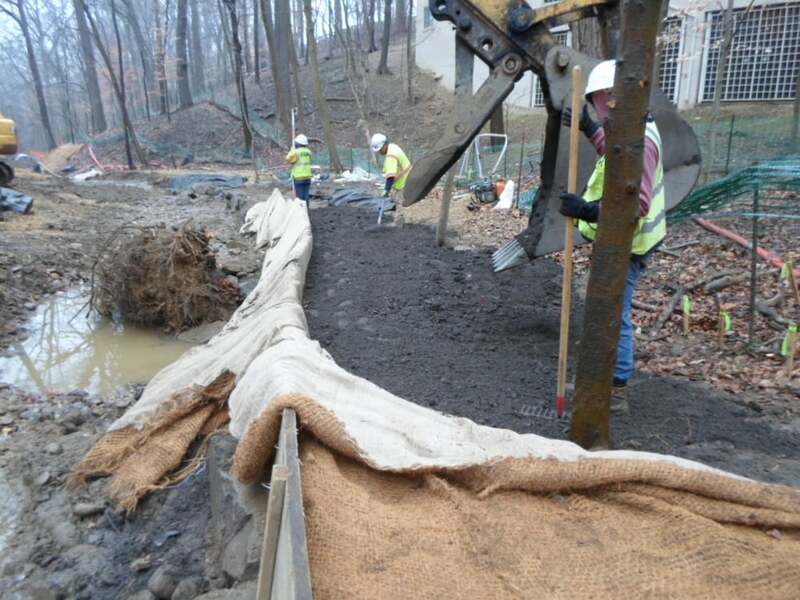 The stream restoration contractor is making a strong push to complete Klingle Creek restoration work before in-channel construction restrictions go into effect in March. Three crews are now working in the two main restoration areas, with Segment 4 approximately 75% complete and Segment 1 just under way (Segments 2 and 3 are complete). 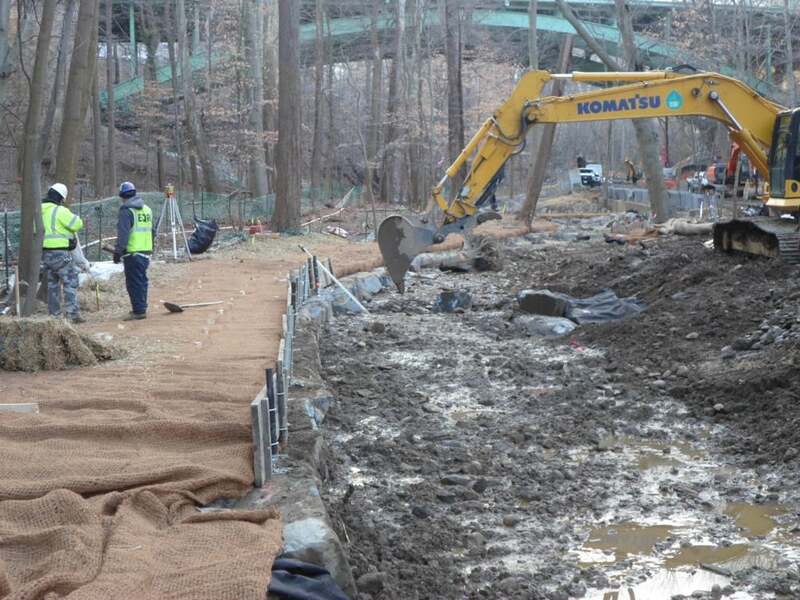 Klingle Creek stream restoration segments. The eastern end of stream Segment 4 will realign Klingle Creek to its natural flow pattern. For decades, the creek was diverted under Klingle Road through a series of pipe culverts, eventually emptying back into the natural creek bed further downstream. With the new trail requiring less space than the old road, the creek bed can now be aligned to follow a natural flow path. Additionally, the new channel will have significantly higher flow capacity than the previous stormwater pipe system. Setting stone toe along the southern stream bank of the new channel alignment. Excavating the new stream channel. Rough grading the new channel prior to stone placement. Step pool construction along the realigned channel. Crews also continue to reestablish the stream banks along Klingle Creek. In addition to the stone toe reinforcement, the contractor is also preparing the banks for new vegetation. The primary means to establish the new banks is through planting soil lifts wrapped in natural coir (coconut) fiber fabric. Installing planting soil and leveling the lift prior to wrapping with coir mat. Wood formwork is used to shape the fabric wrapped lifts. Also pictured is one of the six log placement structures to be installed in the restored channel. The prime contractor continues to work on the new retaining wall across from the Woodley Park Towers building. Crews are installing stone masonry along the concrete wall stem using stone salvaged from previously collapsed historic retaining walls along Klingle Road. The contractor built a temporary tent over the wall and installed heaters to provide appropriate ambient air temperatures for curing the wall mortar. Small heaters are also used to heat the water used to mix the mortar. Bullet heaters and temporary tenting allow for mortar to cure as designed. Washington Gas started Phase 2 excavation and tie-ins on Klingle Road below the Connecticut Avenue Bridge (left and center photos). Washington Gas also continues gas line replacement in Phase 4 along Devonshire Place (right).